Mars Express consists of two parts, the Mars Express Orbiter and Beagle 2, a lander designed to perform exobiology and geochemistry research. Although the lander failed to fully deploy after it landed on the Martian surface, the orbiter has been successfully performing scientific measurements since early 2004, namely, high-resolution imaging and mineralogical mapping of the surface, radar sounding of the subsurface structure down to the permafrost, precise determination of the atmospheric circulation and composition, and study of the interaction of the atmosphere with the interplanetary medium. Due to the valuable science return and the highly flexible mission profile, Mars Express has been granted several mission extensions. The latest one, as of November 2018, is scheduled to end in late 2020, when it is expected to receive another mission extension lasting until 2022. Some of the instruments on the orbiter, including the camera systems and some spectrometers, reuse designs from the failed launch of the Russian Mars 96 mission in 1996 (European countries had provided much of the instrumentation and financing for that unsuccessful mission). The design of Mars Express is based on ESA's Rosetta mission, on which a considerable sum was spent on development. The same design was also used for the Venus Express mission in order to increase reliability and reduce development cost and time. Because of these redesigns and repurposings, the total cost of the project was about $345 million- less than half of comparable U.S. missions. On 19 October 2014, the ESA reported the Mars Express was healthy after the Comet Siding Spring flyby of Mars on 19 October 2014 — as are, as well, all NASA Mars orbiters and ISRO's orbiter, the Mars Orbiter Mission. Arriving at Mars in 2003, 15 years, 3 months and 26 days ago (and counting), it is the second longest surviving, continually active spacecraft in orbit around a planet other than Earth, behind only NASA's still active 2001 Mars Odyssey. The Mars Express mission is dedicated to the orbital (and originally in-situ) study of the interior, subsurface, surface and atmosphere, and environment of the planet Mars. The scientific objectives of the Mars Express mission represent an attempt to fulfill in part the lost scientific goals of the Russian Mars 96 mission, complemented by exobiology research with Beagle-2. Mars exploration is crucial for a better understanding of the Earth from the perspective of comparative planetology. The spacecraft originally carried seven scientific instruments, a small lander, a lander relay and a Visual Monitoring Camera, all designed to contribute to solving the mystery of Mars' missing water. All of the instruments take measurements of the surface, atmosphere and interplanetary media, from the main spacecraft in polar orbit, which will allow it to gradually cover the whole planet. The total initial Mars Express budget excluding the lander was €150 million. The prime contractor for the construction of Mars Express orbiter was EADS Astrium Satellites. a Simulations Campaign was run. The spacecraft was launched on June 2, 2003 at 23:45 local time (17:45 UT, 1:45 p.m. EDT) from Baikonur Cosmodrome in Kazakhstan, using a Soyuz-FG/Fregat rocket. The Mars Express and Fregat booster were initially put into a 200 km Earth parking orbit, then the Fregat was fired again at 19:14 UT to put the spacecraft into a Mars transfer orbit. The Fregat and Mars Express separated at approximately 19:17 UT. The solar panels were then deployed and a trajectory correction manoeuvre was performed on June 4 to aim Mars Express towards Mars and allow the Fregat booster to coast into interplanetary space. The Mars Express was the first Russian-launched probe to successfully make it out of low Earth orbit since the Soviet Union fell. The Near Earth commissioning phase extended from the separation of the spacecraft from the launcher upper stage until the completion of the initial check out of the orbiter and payload. It included the solar array deployment, the initial attitude acquisition, the declamping of the Beagle-2 spin-up mechanism, the injection error correction manoeuvre and the first commissioning of the spacecraft and payload (final commissioning of payload took place after Mars Orbit Insertion). The payload was checked out one instrument at a time. This phase lasted about one month. This five month phase lasted from the end of the Near Earth Commissioning phase until one month prior to the Mars capture manoeuvre and included trajectory correction manoeuvres and payloads calibration. The payload was mostly switched off during the cruise phase, with the exception of some intermediate check-outs. Although it was originally meant to be a "quiet cruise" phase, It soon became obvious that this "cruise" would be indeed very busy. There were star Tracker problems, a power wiring problem, extra manoeuvres, and on the 28th of October, the spacecraft was hit by one of the largest solar flares ever recorded. The Beagle 2 lander was released on December 19, 2003 at 8:31 UTC (9:31 CET) on a ballistic cruise towards the surface. It entered Mars' atmosphere on the morning of December 25. Landing was expected to occur at about 02:45 UT on December 25 (9:45 p.m. EST December 24). However, after repeated attempts to contact the lander failed using the Mars Express craft and the NASA Mars Odyssey orbiter, it was declared lost on February 6, 2004, by the Beagle 2 Management Board. An inquiry was held and its findings were published later that year. 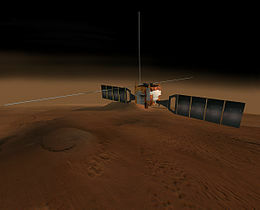 Mars Express arrived at Mars after a 400 million km journey and course corrections in September and in December 2003. On December 20 Mars Express fired a short thruster burst to put it into position to orbit the planet. The Mars Express orbiter then fired its main engine and went into a highly elliptical initial-capture orbit of 250 km × 150,000 km with an inclination of 25 degrees on December 25 at 03:00 UT (10:00 p.m., December 24 EST). First evaluation of the orbital insertion showed that the orbiter had reached its first milestone at Mars. The orbit was later adjusted by four more main engine firings to the desired 259 km × 11,560 km near-polar (86 degree inclination) orbit with a period of 7.5 hours. Near periapsis (nearest to Mars) the top deck is pointed down towards the Martian surface and near apoapsis (farthest from Mars in its orbit) the high gain antenna will be pointed towards Earth for uplink and downlink. After 100 days the apoapsis was lowered to 10,107 km and periapsis raised to 298 km to give an orbital period of 6.7 hours. On May 4, 2005, Mars Express deployed the first of its two 20-metre-long radar booms for its MARSIS (Mars Advanced Radar for Subsurface and Ionosphere Sounding) experiment. At first the boom did not lock fully into place; however, exposing it to sunlight for a few minutes on May 10 fixed the glitch. The second 20 m boom was successfully deployed on June 14. Both 20 m booms were needed to create a 40 m dipole antenna for MARSIS to work; a less crucial 7-meter-long monopole antenna was deployed on June 17. The radar booms were originally scheduled to be deployed in April 2004, but this was delayed out of fear that the deployment could damage the spacecraft through a whiplash effect. Due to the delay it was decided to split the four-week commissioning phase in two parts, with two weeks running up to July 4 and another two weeks in December 2005. The deployment of the booms was a critical and highly complex task requiring effective inter-agency cooperation ESA, NASA, Industry and public Universities. Operations for Mars Express are carried out by a multinational team of engineers from ESA's Operation Centre (ESOC) in Darmstadt. The team began preparations for the mission about 3 to 4 years prior to the actual launch. This involved preparing the ground segment and the operational procedures for the whole mission. The team build-up, headed by the Spacecraft Operations Manager, started about 4 years before launch. He was required to recruit a suitable team of engineers that could handle the varying tasks involved in the mission. For Mars Express the engineers came from various other missions. Most of them had been involved with Earth orbiting satellites. Since orbit insertion Mars Express has been progressively fulfilling its original scientific goals. Nominally the spacecraft points to Mars while acquiring science and then slews to Earth-pointing to downlink the data, although some instruments like Marsis or Radio Science might be operated while spacecraft is Earth-pointing. The Mars Express orbiter is a cube-shaped spacecraft with two solar panel wings extending from opposite sides. The launch mass of 1123 kg includes a main bus with 113 kg of payload, the 60 kg lander, and 457 kg of propellant. The main body is 1.5 m × 1.8 m × 1.4 m in size, with an aluminium honeycomb structure covered by an aluminium skin. The solar panels measure about 12 m tip-to-tip. Two 20 m long wire dipole antennas extend from opposite side faces perpendicular to the solar panels as part of the radar sounder. The Soyuz/Fregat launcher provided most of the thrust Mars Express needed to reach Mars. The final stage of the Fregat was jettisoned once the probe was safely on a course for Mars. The spacecraft's on-board means of propulsion was used to slow the probe for Mars orbit insertion and subsequently for orbit corrections. The body is built around the main propulsion system, which consists of a bipropellant 400 N main engine. The two 267-liter propellant tanks have a total capacity of 595 kg. Approximately 370 kg are needed for the nominal mission. Pressurized helium from a 35-liter tank is used to force fuel into the engine. Trajectory corrections will be made using a set of eight 10 N thrusters, one attached to each corner of the spacecraft bus. The spacecraft configuration is optimized for a Soyuz/Fregat, and was fully compatible with a Delta II launch vehicle. Spacecraft power is provided by the solar panels which contain 11.42 square meters of silicon cells. The originally planned power was to be 660 W at 1.5 AU but a faulty connection has reduced the amount of power available by 30%, to about 460 W. This loss of power does significantly impact the science return of the mission. Power is stored in three lithium-ion batteries with a total capacity of 64.8 Ah for use during eclipses. The power is fully regulated at 28 V, and the Terma power module (also used in Rosetta) is redundant. . During routine phase, the spacecraft's power consumption is in the range of 450 W - 550 W.
Attitude control (3-axis stabilization) is achieved using two 3-axis inertial measurement units, a set of two star cameras and two Sun sensors, gyroscopes, accelerometers, and four 12 N·m·s reaction wheels. Pointing accuracy is 0.04 degree with respect to the inertial reference frame and 0.8 degree with respect to the Mars orbital frame. Three on-board systems help Mars Express maintain a very precise pointing accuracy, which is essential to allow the spacecraft to communicate with a 35-metre and 70-metre dish on Earth up to 400 million kilometres away. The communications subsystem is composed of 3 antennas: A 1.6 m diameter parabolic dish high-gain antenna and two omnidirectional antennas. The first one provide links (telecommands uplink and telemetry downlink) in both X-band (8.4 GHz) and S-band (2.1 GHz) and is used during nominal science phase around Mars. The low gain antennas are used during Launch and early operations to Mars and for eventual contingencies once in orbit. Two Mars lander relay UHF antennas are mounted on the top face for communication with the Beagle 2 or other landers, using a Melacom transceiver. Although communications with Earth were originally scheduled to take place with the ESA 35-meter wide Ground Station in New Norcia (Australia) New Norcia Station, the mission profile of progressive enhancement and science return flexibility have triggered the use of the newest ESA ESTRACK Ground Station in Cebreros Station, Madrid, Spain. In addition, further agreements with NASA Deep Space Network have made possible the use of American stations for nominal mission planning, thus increasing complexity but with a clear positive impact in scientific returns. This inter-agency cooperation has proven effective, flexible and enriching for both sides. On the technical side, it has been made possible (among other reasons) thanks to the adoption of both Agencies of the Standards for Space Communications defined in CCSDS. Thermal control is maintained through the use of radiators, multi-layer insulation, and actively controlled heaters. The spacecraft must provide a benign environment for the instruments and on-board equipment. Two instruments, PFS and OMEGA, have infrared detectors that need to be kept at very low temperatures (about −180 °C). The sensors on the camera (HRSC) also need to be kept cool. But the rest of the instruments and on-board equipment function best at room temperatures (10–20 °C). The spacecraft is covered in gold-plated aluminium-tin alloy thermal blankets to maintain a temperature of 10–20 °C inside the spacecraft. The instruments that operate at low temperatures to be kept cold are thermally insulated from this relatively high internal temperature, and emit excess heat into space using attached radiators. The spacecraft is run by two Control and Data management Units with 12 gigabits of solid state mass memory for storage of data and housekeeping information for transmission. The on-board computers control all aspects of the spacecraft functioning including switching instruments on and off, assessing the spacecraft orientation in space and issuing commands to change it. Another key aspect of the Mars Express mission is the its artificial intelligence tool (MEXAR2). The primary purpose of the AI tool is the scheduling of when to download various parts of the collected scientific data back to Earth, a process which used to take ground controllers a significant amount of time. The new AI tool saves operator time, optimizes bandwidth use on the DSN, prevents data loss, and allows better use of the DSN for other space operations as well. The AI decides how to manage the spacecraft's 12 gigabits of storage memory, when the DSN will be available and not be in use by another mission, how to make the best use of the DSN bandwidth allocated to it, and when the spacecraft will be oriented properly to transmit back to Earth. A replica of the Beagle 2 lander component of Mars Express at the Science Museum London. The Beagle 2 lander objectives were to characterize the landing site geology, mineralogy, and geochemistry, the physical properties of the atmosphere and surface layers, collect data on Martian meteorology and climatology, and search for possible signatures of life. However, the landing attempt was unsuccessful and the lander was declared lost. A Commission of Inquiry on Beagle 2 identified several possible causes, including airbag problems, severe shocks to the lander's electronics which had not been simulated adequately before launch, and problems with parts of the landing system colliding; but was unable to reach any firm conclusions. The spacecraft's fate remained a mystery until it was announced in January 2015 that NASA's Mars Reconnaissance Orbiter, using HiRISE, had found the probe intact on the surface of Mars. It was then determined that an error had prevented two of the spacecraft's four solar panels from deploying, blocking the spacecraft's communications. Beagle 2 was the first British and first European probe to achieve a landing on Mars. The scientific objectives of the Mars Express payload are to obtain global high-resolution photo-geology (10 m resolution), mineralogical mapping (100 m resolution) and mapping of the atmospheric composition, study the subsurface structure, the global atmospheric circulation, and the interaction between the atmosphere and the subsurface, and the atmosphere and the interplanetary medium. The total mass budgeted for the science payload is 116 kg. Mars Radio Science Experiment (MaRS) - Uses radio signals to investigate atmosphere, surface, subsurface, gravity and solar corona density during solar conjunctions. It uses the communications subsystem itself. A small camera to monitor the lander ejection, Visual Monitoring Camera. For more than 5000 orbits, Mars Express payload instruments have been nominally and regularly operated. The HRSC camera has been consistently mapping the Martian surface with unprecedented resolution and has acquired multiple images. ESA announced the discovery of water ice in the south polar ice cap, using data collected by the OMEGA instrument. Mars Express orbiter reaches final science orbit altitude around Mars. Orbiter detects polar ice caps that contain 85% carbon dioxide (CO2) ice and 15% water ice. A press release announces that the orbiter has detected methane in the Martian atmosphere. Although the amount is small, about 10 parts in a thousand million, it has excited scientists to question its source. Since methane is removed from the Martian atmosphere very rapidly, there must be a current source that replenishes it. Because one of the possible sources could be microbial life, it is planned to verify the reliability of these data and especially watch for difference in the concentration in various places on Mars. It is hoped that the source of this gas can be discovered by finding its location of release. ESA announced that the deployment of the boom carrying the radar-based MARSIS antenna was delayed. It described concerns with the motion of the boom during deployment, which can cause the spacecraft to be struck by elements of it. Further investigations are planned to make sure that this will not happen. Scientists working with the PFS instrument announced that they tentatively discovered the spectral features of the compound ammonia in the Martian atmosphere. Just like methane discovered earlier (see above), ammonia breaks down rapidly in Mars' atmosphere and needs to be constantly replenished. This points towards the existence of active life or geological activity; two contending phenomena whose presence so far have remained undetected. In 2005, ESA scientists reported that the OMEGA (Visible and Infrared Mineralogical Mapping Spectrometer)(Observatoire pour la Minéralogie, l'Eau, les Glaces et l'Activité) instrument data indicates the presence of hydrated sulphates, silicates and various rock-forming minerals. The delayed deployment of the MARSIS antenna has been given a green light by ESA. It is planned to take place in early May 2005. The first boom of the MARSIS antenna was successfully deployed. At first, there was no indication of any problems, but later it was discovered that one segment of the boom did not lock. The deployment of the second boom was delayed to allow for further analysis of the problem. Using the Sun's heat to expand the segments of the MARSIS antenna, the last segment locked in successfully. The second boom was deployed, and on June 16 ESA announced it was a success. ESA announces that MARSIS is fully operational and will soon begin acquiring data. This comes after the deployment of the third boom on June 17, and a successful transmission test on June 19. The High Resolution Stereo Camera (HRSC) has obtained images of the Cydonia region, the location of the famous "Face on Mars". The massif became famous in a photo taken in 1976 by the American Viking 1 Orbiter. The image recorded with a ground resolution of approximately 13.7 metres per pixel. The Mars Express spacecraft emerged from an unusually demanding eclipse introducing a special, ultra-low-power mode nicknamed 'Sumo' - an innovative configuration aimed at saving the power necessary to ensure spacecraft survival. This mode was developed through teamwork between ESOC mission controllers, principal investigators, industry, and mission management. In October 2006 the Mars Express spacecraft encountered a superior solar conjunction (alignment of Earth-Sun-Mars-orbiter). The angle Sun-Earth-orbiter reached a minimum on 23 October at 0.39° at a distance of 2.66 AU. Operational measures were undertaken to minimize the impact of the link degradation, since the higher density of electrons in the solar plasma heavily impacts the radio frequency signal. Following the loss of NASA's Mars Global Surveyor (MGS), Mars Express team was requested to perform actions in the hopes of visually identifying the American spacecraft. Based on last ephemeris of MGS provided by JPL, the on-board high definition HRSC camera swept a region of the MGS orbit. Two attempts were made to find the craft, both unsuccessful. First agreements with NASA undertaken for the support by Mars Express on the landing of the American lander Phoenix in May 2008. The small camera VMC (used only once to monitor the lander ejection) was recommissioned and first steps were taken to offer students the possibility to participate in a campaign "Command Mars Express Spacecraft and take your own picture of Mars". As result of the science return, the Science Program Committee (SPC) granted a mission extension until May 2009. The High Resolution Stereo Camera (HRSC) has produced images of key tectonic features in Aeolis Mensae. The Mars Express Team was the winner of the Sir Arthur Clarke Award for Best Team Achievement. The ESA's Science Programme Committee has extended the operations of Mars Express until December 31, 2009. ESA's Science Programme Committee has approved the extension of mission operations for Mars Express until 31 December 2012. Flyby of Phobos to measure Phobos' gravity. Safe mode following a Solid-State Mass Memory problem. Science operations are resumed using the Short Mission Timeline and Command Files instead of the Long Time Line resident on the suspect Solid-State Mass Memory. Resumes full science operations. There is still enough fuel for up to 14 additional years of operation. Solar corona studied with radio waves. Assisted US probes Mars Odyssey and Mars Reconnaissance Orbiter in data collection and transfer on the Mars Science Laboratory landing. 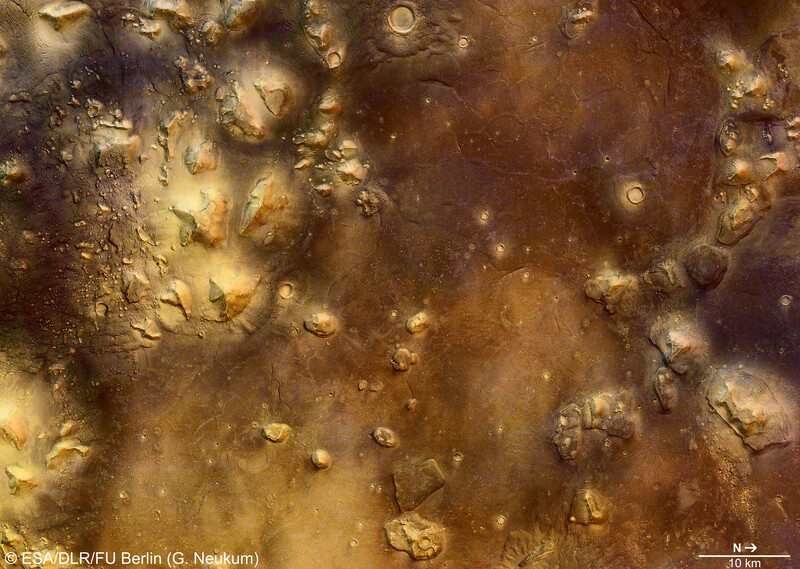 Mars Express produced a near-complete topographical map of Mars' surface. Assisted with data collection and transfer for the Schiaparelli EDM lander landing. Takes noted image spanning from the North pole up to Alba Mons and even farther south. The image was released in December 20, 2017 and was captured by HRSC. July 2018, a discovery is reported based on MARSIS radar studies, of a subglacial lake on Mars, 1.5 km (0.93 mi) below the southern polar ice cap, and about 20 km (12 mi) wide, the first known stable body of water on Mars. December 2018 Mars Express relays images of the 80-kilometer wide Korolev Crater filled with approximately 2200 cubic kilometers of water ice on the Martian surface. Based on further evidence the crater ice is still part of much vaster ice resources at Mars poles. Based on data from the HRSC camera, there is geological evidence of an ancient planet-wide groundwater system. MARSIS Uni Roma "La Sapienza"
^ "ESA - Mars Express - Mars Express Frequently Asked Questions (FAQs)". ESA. 18 February 2009. Retrieved 28 March 2016. ^ "Extended life for ESA's science missions". ESA. Retrieved 14 November 2018. ^ Denis, Michel (20 October 2014). "Spacecraft in great shape – our mission continues". European Space Agency. Retrieved 21 October 2014. ^ Webster, Guy; Brown, Dwayne; Jones, Nancy; Steigerwald, Bill (19 October 2014). "All Three NASA Mars Orbiters Healthy After Comet Flyby". NASA. Retrieved 20 October 2014. ^ Staff (21 October 2014). "I'm safe and sound, tweets MOM after comet sighting". The Hindu. Retrieved 21 October 2014. ^ "Mars Express: Summary". European Space Agency. 29 Mar 2011. ^ "Mars Express". NSSDC ID: 2003-022A. NASA. Archived from the original on 2013-08-04. Retrieved 2018-12-07. ^ a b "Beagle 2 ESA/UK Commission of Inquiry". NASASpaceFlight.com. 5 April 2004. Retrieved 29 March 2016. ^ a b c d "The spacecraft / Mars Express". ESA. 10 October 2005. Retrieved 29 March 2016. ^ Stage, Mie (19 January 2014). "Terma-elektronik vækker rumsonde fra årelang dvale". Ingeniøren. Retrieved 29 March 2016. ^ Jensen, H.; Laursen, J. (2002). "Power Conditioning Unit for Rosetta/Mars Express". Space Power. Astrophysics Data System. 502: 249. Bibcode:2002ESASP.502..249J. ^ "MEX — ASI-PROC". Planetary Radar Operational Center. 29 March 2016. Archived from the original on 13 April 2016. Retrieved 29 March 2016. ^ "QinetiQ to put Mars in the picture". Qinetiq. Archived from the original on 31 August 2006. Retrieved 29 March 2016. Consisting of a lightweight bespoke transponder and transceiver weighing less than 650 grams, the system will provide the 10,000-kilometre UHF radio communications link between the Mars Express orbiter and Beagle-2 lander. ^ a b "Artificial intelligence boosts science from Mars". ESA. 29 April 2008. Retrieved 29 March 2016. ^ Cesta, Amedeo (2007). "Mexar2: AI Solves Mission Planner Problems" (PDF). IEEE Intelligent Systems. 22 (4): 12–19. doi:10.1109/MIS.2007.75. ^ Andrew Wilson; Agustin Chicarro (2004). ESA SP-1240: Mars Express: the scientific payload. Noordwijk, Netherlands: ESA Publications Division. ISBN 978-92-9092-556-9. ^ Bibring JP, Langevin Y, Mustard JF, Poulet F, Arvidson R, Gendrin A, Gondet B, Mangold N, Pinet P, Forget F (2006). "Global mineralogical and aqueous mars history derived from OMEGA/Mars express data". Science. 312 (5772): 400–404. Bibcode:2006Sci...312..400B. doi:10.1126/science.1122659. PMID 16627738. ^ a b c d e f Chicarro, A.F. (2003). "MARS EXPRESS MISSION: Overview and Scientific Observations" (PDF). Retrieved 29 March 2016. ^ Peplow, Mark (7 September 2005). "Martian methane probe in trouble". News@nature. Nature. doi:10.1038/news050905-10. Retrieved 29 March 2016. ^ "Mars Express orbiter instruments". ESA. 30 November 2005. Retrieved 29 March 2016. ^ "Water at Martian south pole". ESA. 17 March 2004. Retrieved 29 March 2016. 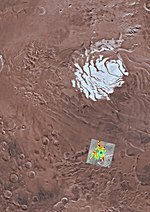 ^ "Water and methane maps overlap on Mars: a new clue?". ESA. 20 September 2004. Retrieved 29 March 2016. ^ Mustard, JF (2005). "Olivine and Pyroxene Diversity in the Crust of Mars". Science. 307 (5715): 1594–7. doi:10.1126/science.1109098. PMID 15718427. ^ Bargery, AS; et al. (2006). "NEAR-INFRARED ANALYSIS OF TEMPE TERRA, OLYMPICA FOSSAE AND NILI FOSSAE FROM OMEGA DATA". Lunar and Planetary Science. XXXVII: 1684. ^ "Green light for deployment of ESA's Mars Express radar". ESA. 8 February 2005. Retrieved 29 March 2016. ^ "First Marsis radar boom deployed". BBC News Online. 5 May 2005. Retrieved 29 March 2016. ^ "Delay hits Mars radar deployment". BBC News Online. 9 May 2005. Retrieved 29 March 2016. ^ "First MARSIS boom successfully deployed". ESA. 11 May 2005. Retrieved 29 March 2016. ^ "Smooth deployment for second MARSIS antenna boom". ESA. 16 June 2005. Retrieved 29 March 2016. ^ "Mars Express radar ready to work". ESA. 22 June 2005. Retrieved 29 March 2016. ^ "Cydonia - the face on Mars". ESA. 21 September 2006. Retrieved 29 March 2016. ^ "Mars Express successfully powers through eclipse season". ESA. 26 September 2006. Retrieved 29 March 2016. ^ "The planetary adventure continues - Mars Express and Venus Express operations extended". ESA. 27 February 2007. Retrieved 29 March 2016. ^ "Tectonic signatures at Aeolis Mensae". ESA News. European Space Agency. 28 June 2007. Retrieved 29 March 2016. ^ "ESA extends missions studying Mars, Venus and Earth's magnetosphere". ESA. 9 February 2009. Retrieved 29 March 2016. ^ "Mission extensions approved for science missions". ESA. 7 October 2009. Retrieved 29 March 2016. ^ "Phobos Flyby Success". Space Fellowship. 5 March 2010. Retrieved 29 March 2016. ^ a b c d e "Mars Express observations temporarily suspended". ESA. 24 November 2011. Retrieved 29 March 2016. ^ "Mars Express steadily returns to routine operation". ESA. 24 November 2011. Retrieved 29 March 2016. ^ Clark, Stephen (15 February 2012). "Mars Express back in business at the red planet". Spaceflight Now. Retrieved 29 March 2016. ^ "Radio sounding of the solar corona with Mars Express". ESA. 24 July 2012. Retrieved 29 March 2016. ^ Gibney, Elizabeth (28 October 2013). "Spectacular flyover of Mars". Nature News. Retrieved 2013-11-17. ^ a b "ESA Releases Stunning New Image of Mars". ^ "Mars Express - 14 years at the Red Planet". ^ Orosei, R.; et al. (25 July 2018). "Radar evidence of subglacial liquid water on Mars". Science. 361 (6401): 490–493. doi:10.1126/science.aar7268. PMID 30045881. Retrieved 25 July 2018. ^ Chang, Kenneth; Overbye, Dennis (25 July 2018). "A Watery Lake Is Detected on Mars, Raising the Potential for Alien Life - The discovery suggests that watery conditions beneath the icy southern polar cap may have provided one of the critical building blocks for life on the red planet". The New York Times. Retrieved 25 July 2018. ^ "Liquid water 'lake' revealed on Mars". BBC News. 25 July 2018. Retrieved 25 July 2018. ^ "A winter wonderland in red and white – Korolev Crater on Mars". German Aerospace Center (DLR). Retrieved 20 December 2018. ^ Salese, Francesco; Pondrelli, Monica; Neeseman, Alicia; Schmidt, Gene; Ori, Gian Gabriele (2019). "Geological Evidence of Planet‐Wide Groundwater System on Mars". Journal of Geophysical Research: Planets. 124. doi:10.1029/2018JE005802. ^ "First evidence of planet-wide groundwater system on Mars". ESA. Retrieved February 28, 2019. Wikimedia Commons has media related to Mars Express.